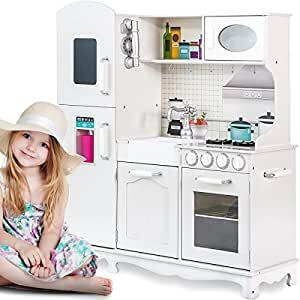 ãImaginative PlayãWhile providing fun hours for your young chefs, this kitchen play set helps to develop imitative, imaginary play, role play and creativity. ãMulti-function KitchenãThis kid-sized kitchen includes refrigerator, freezer, oven, water dispenser with cup, dishwasher, with all the doors open and close, knobs click and turn. Cordless phone included. ãSafety and Durability ãMade with long lasting materials, the playset finished with non-toxic paint, which features no harmful odor so that the kids can play it carefreely. ãAssembly & WarrantyãWe offer explicit and understandable installation guide, helping you easily set up the set. All hardware included. With a wipe-clean surface, easy to clean. Any assembly question, please feel free to contact us. Free one year warranty. ãDimension & SpecificationsãAssembled Product Dimensions (L x W x H) : 36″ x 12″ x 40″ (L x W x H), No cookware accessories. Recommended for kids ages three and up.